View of a farm near Bradner Creek in West Sparta, Livingston County. 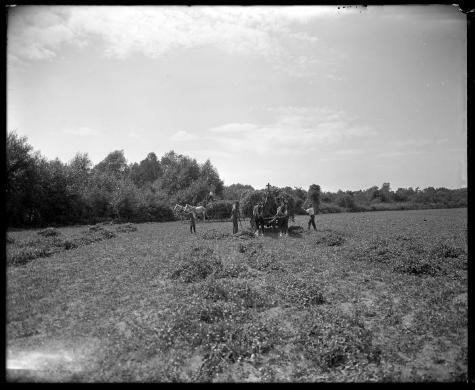 Four men (two may actually be teenagers) are harvesting a pea crop onto a horse-drawn wagon. A second horse-drawn wagon laden with peas is right behind. Bradner Creek is behind the bushes in the background. The farmland is identified as "Parcel 55." The following note was included with the photograph: "This land testified to as being very heavily silted from break in bank Canasedaga on Lake property before Groveland." The reason this image was created by the New York State Conservation Commission is not known. Source: New York State Archives, New York (State). Conservation Dept. Photographic prints and negatives, [ca. 1904-1949], 14297-87, SARA No. 780.